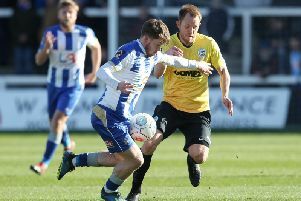 Jake Cassidy described Hartlepool United as a ‘negative’ club - but is he right? In an recent interview with Kent Online, the striker, who rejoined Maidstone on loan earlier this week, said he was weighed down by the ‘poisonous’ atmosphere at the Super 6 Stadium. His comments attracted a mixed response from Pools supporters. @mhanger331 commented: “Well.. as long as all the players put a shift in and battle to the end, the fans will be positive! Win, lose or draw. But when they don’t that causes the ‘frustration and negativity’ We don’t ask for much really!! Yet some fans agreed with the striker’s comments and believed he made some valid points.